Spring Is Nigh! 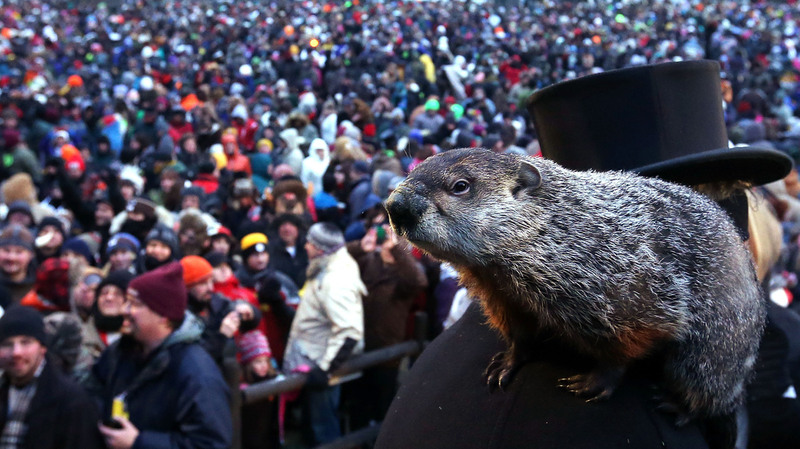 Punxsutawney Phil Predicts An Early End To Winter : The Two-Way It's a tradition that goes back to 1887, and while he's not always correct, the Punxsutawney, Pa., groundhog has a massive following who watch his every move on Groundhog Day. Punxsutawney Phil climbs on the shoulder of handler John Griffiths. The groundhog did not see his shadow during the 127th Groundhog Day Celebration in Punxsutawney, Pa., on Saturday. "An early spring for you and me," is this year's prediction from Punxsutawney Phil, the premiere Groundhog Day forecaster. With an estimated 35,000 spectators watching him Saturday morning, the groundhog — or as he is known to his followers, "the seer of seers" — did not see his shadow. Each year on Feb. 2, the tradition is the same. Thousands chant his name. An entourage, which includes a bodyguard, a handler and a protector, awaken him from his burrow. His handler then sets him atop his oak stump and as his inner circle surrounds him, Phil forecasts whether or not winter will last six more weeks. "The king of the groundhogs ... was awakened from his borrow at 7:28 with a tap of the president's cane," his protector, Bob Roberts, said at the 127th annual event in Punxsutawney, Pa. "Phil was lifted from his burrow by his handlers and greeted by his tens of thousands of faithful followers." The "prognosticator of prognosticators' " prediction brings good news for those who are ready to throw off their winter jackets. If you missed it Saturday morning, the full event at Gobbler's Knob can be seen here. His inner circle says he has no peer, yet there are other groundhogs seeking to usurp his stump. "There's Staten Island Chuck, in New York; General Beauregard Lee, in Atlanta; and Wiarton Willie, in Wiarton, Ontario, among others noted by the National Climactic Data Center 'Groundhog Day' Web page.
" 'Punxsutawney can't keep something this big to itself,' the Data Center said. 'Other prognosticating rodents are popping up to claim a piece of the action.' "
And while Punxsutawney Phil's predictions have not always been accurate, this year, Staten Island Chuck backed him up. Chuck also did not see his shadow.